// Constant brightness output pattern & no overheating or mode dropping makes the MH2C a reliable utility/tactical/rescue flashlight. // View the supplemental video in the 5 Point Review below to see 40-80 feet of real world use. // High performance light in the EDC sized compact category but slightly longer to accommodate a deeper reflector which utilizes the class standard output more efficiently for real world use. The next step up is the Nitecore MH25 which has higher output but also a larger reflector for even more reach. 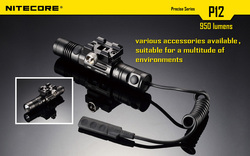 The other similar compact options like the Nitecore P12, Olight M18 Striker or even the PD35, for those lights they predominantly work only well in 30-50 ft range because they don't feature the deeper reflector. additional CR123 battery in the Elzetta. The MH2C with it's constant brightness drain pattern means that after even after 40 minutes and beyond it will continue to produce the max output as the rest of the competition will begin to slowly dim, and it does so without over heating issues or dropping modes like some other lights. // The advertised feature is this flashlight can take the place of a battery charger in an emergency kit or travel set up. Micro USB ports and their adapters can be found in airports, cars and local stores, though the light operates with a constant brightness output so it's not necessary to keep the battery fully charged. As a emergency striking tool the added length from the longer design makes this light a better striking tool on either end when in hand. When it comes to complete lockout (disabling of the light by loosening the caps) it is not necessary because the tail cap has guards, but in a tactical situation the light will switch to it's alternate mode if the primary reflector side is loosened which is better than shutting off. The tail cap end if slightly loosened will shut off but that is typical among the competition because that is not the striking side. This can all be fixed with Locktite* on the tail cap threading. The only other perceivable flaw is the pocket clip. Switching to a clip that's more reinforced will provide the tension needed for more security. // Nitecore flashlights tend to not be completely water tight and humidity can form inside the lens. Despite this the light can actually work even if completely flooded with water inside the body which is very impressive for it's construction. // Parent company Sysmax also owns Jetbeam. Fantastic all around performance for it's category with very well thought out design features for a variety of end users //Tactical lock out means rather than shutting off if the light becomes loose it will switch to secondary modes //Slightly less output than the P12 but better projection through tinted glass and distances of 70-80 feet //Highly recommended flashlight that stands among the best available //An intuitive design that allows for a variety of modifications. Hope more people get a chance to experience this fine light and all it has to offer.